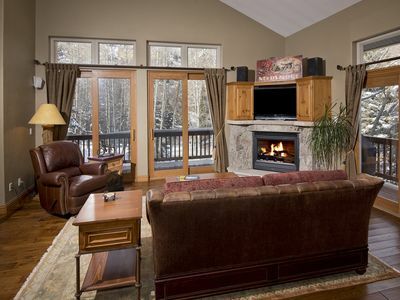 Our beautiful mountain retreat is a 6 bedroom private home located in the popular West Vail area. 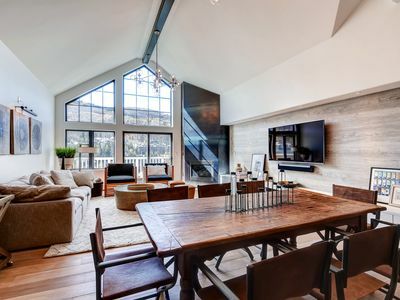 Situated on a ¼ acre and nestled among beautiful pine trees, this home has all the conveniences of a large private, spacious home, yet is located steps (40 yards) to the free Town of Vail bus service that will have you in the Heart of Lionshead in 6 minutes or Vail Village in 12 minutes for skiing, shopping and dining. No car needed! 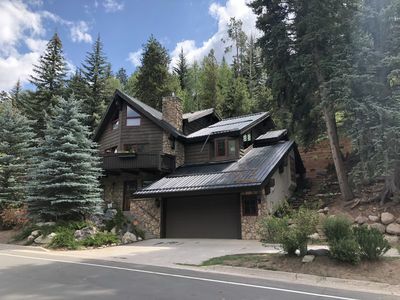 This home is in a coveted location: 40 yards to the free Town of Vail taking you to Vail Village for skiing, shopping, restaurants, bars and theater, or ride your bike to town along the scenic Gore Creek bikeway (about 10-15 minute bike ride). Donovan's Park and playground is less than a 5 minute walk down the road. 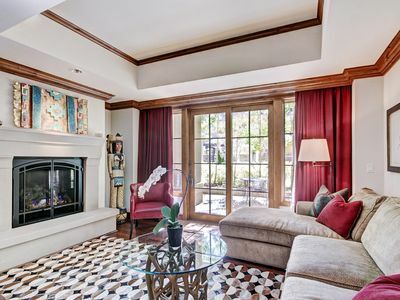 Our home has been recently updated with new paint, carpet, decor and bedding. 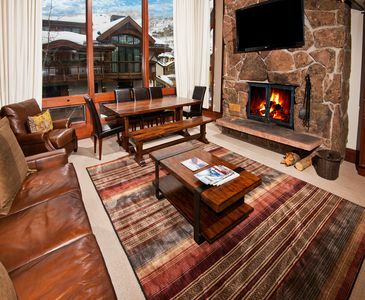 Enjoy the private hot tub or simply relax in front of the wood burning fireplace after a busy day of skiing. 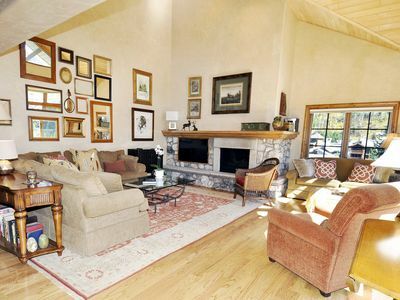 This home is perfect for family gatherings or friends getting together and sleeps up to 14 guests. 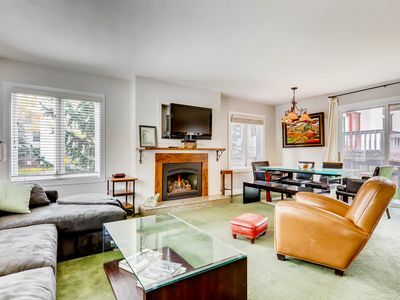 We have the main home (4 bedrooms and 3 full bathrooms - sleeping 10) plus a large apartment (large living area, 2 bedrooms and 1 full bathroom - sleeping 4). 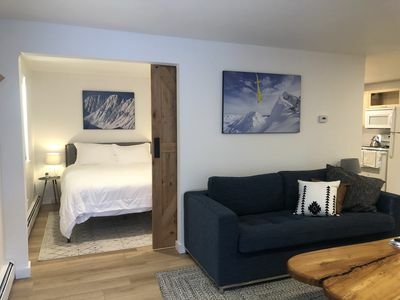 Double CONNECTED garage, heated driveway, with parking available for up to 5 cars (2 cars in x 3 cars out) – no carrying luggage in the SNOW!! 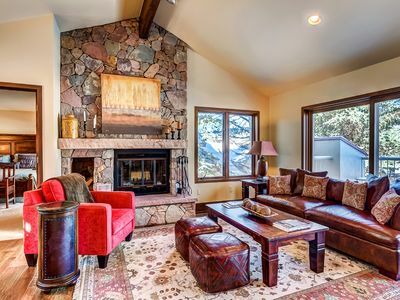 Our home has a warm, rustic cabin feel with wood ceilings, flagstone and stunning pecan hardwood floors. 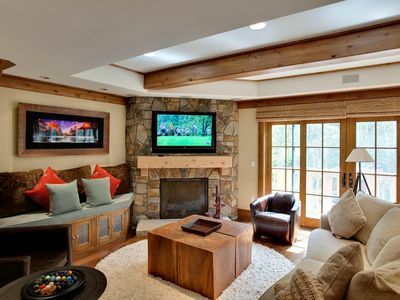 There are two separate living spaces both with flat-screen TV’s - one for the adults and one for the kids! 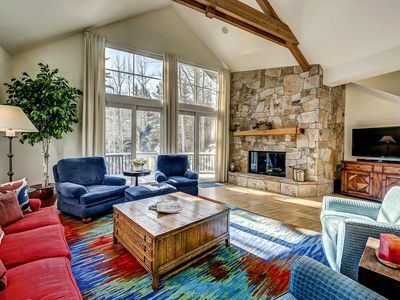 The main living room has beautiful vaulted wood ceilings with a stone wood burning fireplace. 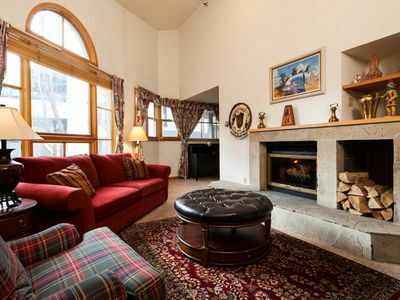 Enjoy a glass of wine in front of the fire-place or step outside to enjoy your wine on the large front deck. 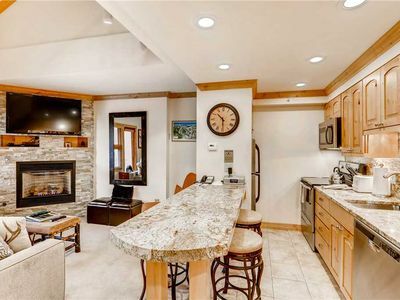 The fully equipped kitchen has updated knotty alder cabinets, granite counter tops with plenty of counter space and supplies/spices for all your cooking needs and a complete selection of cookware, platters and small appliances. We have everything you would need for a small dinner or a huge feast. 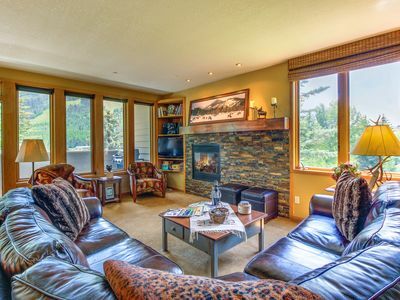 Other amenities include private hot tub, wood-burning fireplace, gas BBQ grill, 3 flat screen TV's, 3 DVD players, hi-speed internet (WIFI), stereo system, books, board games, washer/dryer in the main house and the apartment. We also have items for small children such as a Pak n Play, high chair etc. 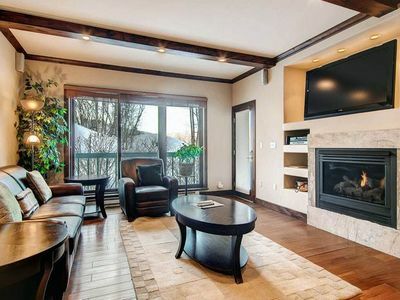 We can provide recommendations for: Grocery Service, Massage Service, Ski Butler Service, Ski Lockers and Catering. 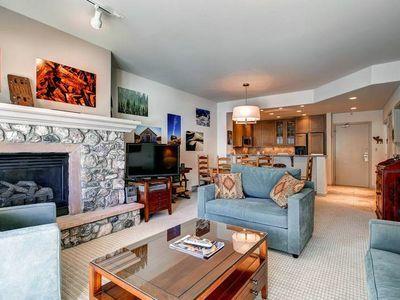 Master 1 – Completely renovated full bath, with standalone tub, steam shower, double shower heads, double vanity with granite. 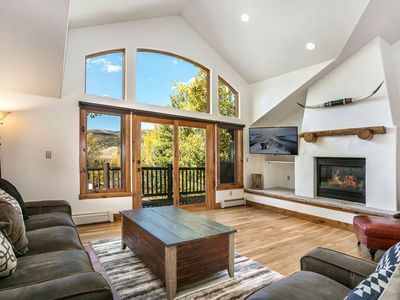 Alpine and Nordic skiing, snowshoeing, ice skating (Dobson Ice Arena), mountain-biking, hiking, biking, golf, fly fishing, and tennis are all nearby. 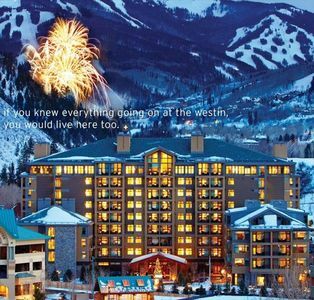 We really hope you can enjoy an amazing experience at our house and hope to see you return! 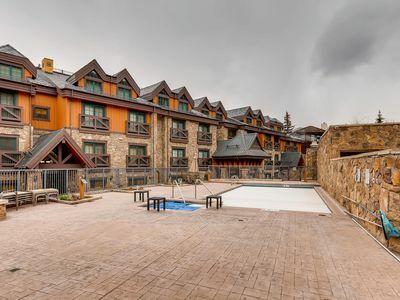 Relaxing 3 Br Condo In The Heart Of Vail - Explore now! 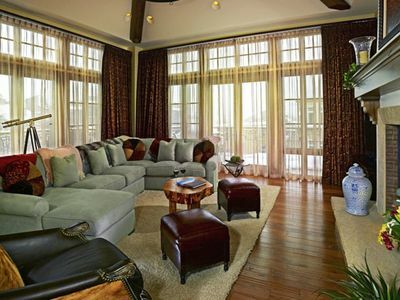 Exclusive Ritz-Carlton Condominium with 2Br and Valley View!